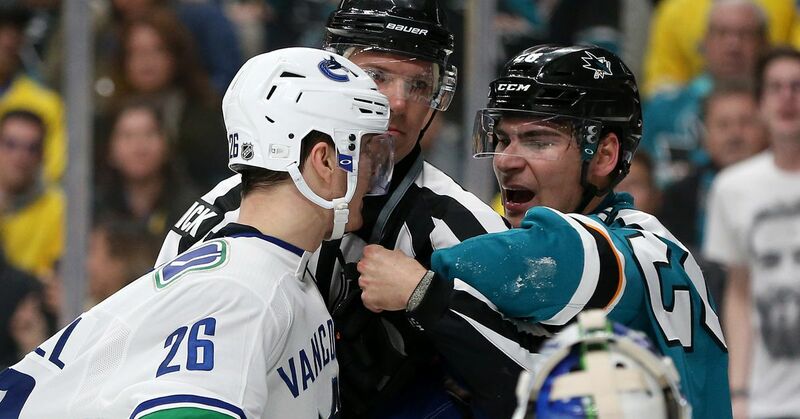 When San Jose Sharks faces Vancouver Canucks, it tends to be a fun affair, and tonight it should be no exception. This will be the last game of the season series between these two teams in the Rogers Arena tonight. The last time these two teams collided was Warriors Night at SAP Center on February 16, when Sharks pushed past Canucks, 3- 2. Apart from that game, it has been all Sharks so far in the season series, not just in the stand but on the scoreboard. Sharks have scored Canucks 12-4 in the three games they have played each other so far. When Sharks have their playoff matchup with Vegas Golden Knights in stone, it seems that they will adjust their lineup a bit tonight. Captain Joe Pavelski is expected to return tonight because he has been out of the match for the last eight games due to an undamaged injury. Jacob Middleton will also include Joakim Ryan tonight. On the other hand, Canucks did not succeed with injuries. They got Sven Baertschi back from another battle with concussion-specific symptoms that disturbed him this season, but will be without Antoine Roussel and Brandon Sutter's services for the rest of the season. Jake Virtan's availability tonight is uncertain. 8 NHL Draft, signed a three-year entry level contract with Canucks, which debuted yesterday on Thursday against the Los Angeles Kings. Sharks get their first look at him tonight when he is expected to play on the third defensive pairing with Luke Schenn. Puck drop from Rogers Ar one is wise know 7 Pacific / 10 p.m. Eastern and will be posted on NBC Sports Plus on the Bay Area market, Sportsnet Pacific in the Vancouver market and is NHL.tv Free Game of the Day, coinciding with a campaign that allows you to watch a game on NHL.tv free this week. The radio call is carried by 98.5 KFOX or can be streamed through the Sharks app. Check back to puck drop for live updates and reactions. Greetings, one and all! My name is Bryan, and I'm looking forward to covering this hopelessly unreleased game of hockey tonight. Let's hope the boys get a good result! 18:46: Pavelski camping out in front of the net. I missed this. 18:32: That … was a nice set-up goal by Canucks. Jones definitely needs to stop things like that, but if he wants to help the Sharks, he takes care of the Golden Knights in round 1. 18:08: Micheal Haley and Luke Schenn drop the gloves. This is the quietest I have ever heard a crowd for a fight. 14:52: SCORE! Kevin Labanc shoots a shot of Brenden Dillon, who takes a jump but ends behind Thatcher Demko and we have a slip! 13:35: Timo Meier with a nice shot that is stopped by Demko, and that's the most I have heard Rogers so far tonight. 10:26: We have a penalty for Canucks when Adam Gaudette gets stuck. Certainly looked like one to me. 9:14: SCORE! Welcome back, Captain! Joe Pavelski is right here at the door to return home from Tomas Hertl, his 38th goal in the season, and it's a 2-1 lead! With Joe Thornton getting the secondary assistant, he has officially tied Steve Yzerman into all-time help! We see a Hall of Famer, people! 5:16: Justin Braun with a nice little zone entrance. 4:58: Sheesh, Donskoi, doesn't make them like that! Donskoi dangles around rookie, Quinn Hughes, and makes Alex Biega space and runs into Thatcher Demko! Unfortunately, Demko saved, but it is a huge individual effort. 3:46: Jamie is right, Jake Middleton has done a good job defensively this period. 2:58: Jumbo Joe is just waiting too long to pull the trigger, but when he did it went straight over the net. 1:32: Alex Edler takes the place to cut, and Sharks will lead to power play for the second time this period. The final version of the four-part FTF vs. Lachlan rivalry goes off to a good start. Sharks dominated this period for Corsi for%, 70.4% to 29.6%. 19:07: A bad line change of sharks comes almost back to bite them when Loui Eriksson jumps up on a lead pass, but Jones stops him. 18:28: Joe Pavelski almost capitalizes on a one-hour, but Demko flashes the glove. 17:15: It's a cannon of a shot from Tim Heed, but it pushes off Quinn Hughes skate. No problems for Thatcher Demko. 15:09: Couture can't slam it home on the back of a great care by Joe Pavelski. 14:57: Jake Middleton does not have his first NHL goal or point, YET, but he has his first penalty minutes when he is sent out for tripping. Welcome to the league, buddy. Canuck's head to PP. 12:57: The punishment was killed. 6:53: Randy Hahn has just referred Ron Burgundy while talking about San Diego. I'm glad he didn't tell us what San Diego meant in German. 5:30: Jones comes out of the curl to break a chance. 4:56: The Canucks still have only ten-well, now eleven shots on target? 4:11: Martin Jones with a huge rescue that stopped Brock Boeser at the door! 3:21: Markus Granlund with an obvious slash, that he is worried for some reason, and Hajer goes back to the power game. 1:21: And this punishment expires. For the most part, it was an unexpected period – but hats off to Martin Jones to come up with some great savers, especially Brock Boeres motorway robbers. Hopefully he can keep stops like those in these last games and throughout the playoffs. The Canucks turned the script on the sharks, benefiting in CF% in second- 60.7% for Canucks and 39.3% for Sharks. 19:42: Evander Kane tries a one-handed staff, but it's too easy for Thatcher Demko. 16:56: Micheal Haley seems injured. It seems that he injured his hand and he goes straight to the closet. 15:37: Pavelski is right there between the hash marks, but Demko saves. 15:05: Tim Heed calls one of the post! 14:18: They play Crab Rave hahahahaha. 13:33: Yikes, Jones made a bad decision to pass and it almost cost him. 12:53: Evander Kane is sitting to hang, but he disputes the call and says his stick was caught. In any way, Canucks go back to the power game. 12:20: Hertl with a good opportunity for the penalty killed, turned and shoot. 8:42: Martin Jones stops Loui Eriksson, but Tanner Pearson does it at home … or does he? The call is overturned, it's a good goal and we have a tie game. Peter DeBoer is not happy. And now he has challenged goaltender interference. Call stands, good measure, DeBoer loses his timeout. 6:21: It's definitely a miscue by Martin Jones, and Canucks takes the lead. Markus Granlund will be credited with the goal. 4:30: I don't know why I'm so angry at a pointless game, but I am. Maybe it's because I just feel terrible. 2:26: Sharks goes back to power play, Bo Horvat is sent to slash. 1:30: Troy Stecher just scored an empty nights from the other side of the rink.